More often than not, trying to find particular pieces of government data is a hellish experience – even when the data already exists somewhere online! Too often, government data “moves around” and has no permanence. The Problem: Government websites are ever changing and cannot be cited. Content changes without notice or accountability. The Solution: The Citeability Codeathon in Washington DC, April 9-10, 2010, aimed at making government information accessible, reliable, and transparent with advanced permalinks. 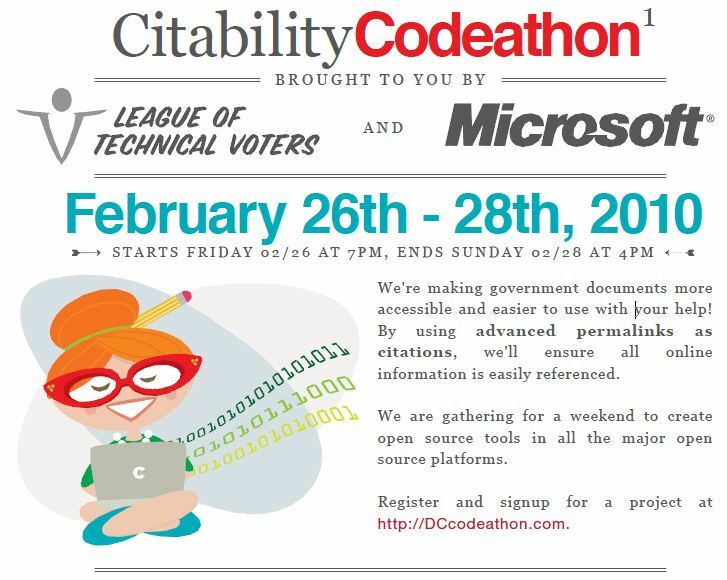 I’m going to be there, kicking off this exciting two-day Codeathon event tomorrow evening, which Microsoft is co-sponsoring with the League of Technical Voters, and supporters at the Sunlight Foundation, Archive.org, and Apture. The Codeathon is being hosted at the Microsoft Chevy Chase office, and all the necessary logistics and details are at www.Citeability.org. The focus of the effort is on making government documents more accessible and citable; and so the event is of course open to the public! There’s already been strong sign-up activity from the open source, non-Microsoft developer community… it’s going to be interesting to see if we get equally robust attendance by Microsoft-platform developers. To be honest, this is a non-denominational effort, or rather a fully inclusive effort, as befitting the universal importance of interoperability, government transparency, and openness. The Citeability movement’s coders have already been hacking away at relevant projects prior to the Codeathon per se, and will demo those projects at the event itself in the final special showcase event on Sunday April 11, 4pm – 6pm. If you’re not a coder but a consumer, a user, or a government IT leader and want to see the cutting edge of enabling technology for your work, come to the Sunday showcase. There’ll be catered dim-sum! Lewis, thanks for the fantastic context on this event. What a great activity! This will, I’m sure, make a positive difference. Thanks a lot Bob – hope you’ll blog about the results, some cool projects being worked, under conditions of great interoperability.